Field trips for Primary Module students are an integral part of their Science and Social Studies units. In years past, students visited Birch Aquarium, The San Diego Zoo, the La Mesa Police and Fire Department, La Mesa City Council Chambers, Legoland, the Rueben H. Fleet Science Center, Pumpkin Patch, Victoria’s Gardens, and various theater productions across the county. Elementary Module trips Each trip for Elementary Module students is designed to encourage critical thinking skills, team building, and positive interactions with their classmates. Third graders visit Fletcher Hills Library-El Cajon as part of their preparation for writing book reports and research reports in Language Arts classes. In alternating years, third graders also visit the Barona Cultural Museum and the Kumeyaay Village as part of their study of Native American culture. 4th graders visit San Diego’s Old Town, the Mission at San Juan Capistrano, and they spend a full night aboard the Star of India. Old Town San Diego, considered the birthplace of California, has knowledgeable docents who dress the students in clothing representative of one of San Diego’s four historic communities: Kumeyaay, Spanish, Mexican, and American. 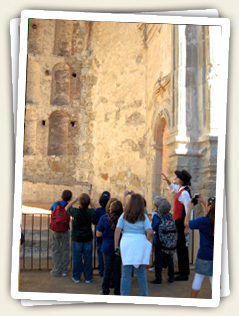 Typically, students visit the mansion, La Casa de Estudillo; the artifact rich La Casa de Machado y Stewart; Mason Street School,California’s first public schoolhouse; the San Diego Union Printing Office; and the first courthouse. At Mission San Juan Capistrano, students receive a guided tour exploring the daily life of both the Padres and Native Americans that lived and worked on the mission. Through vivid storytelling, the students experience a unique, first hand account of some of the challenges the Native Americans faced. Transportation to and from is provided by Amtrak. Aboard the Star of India, located at the San Diego Maritime Museum, 4th graders embark back into time to the Gold Rush period. Among various hidden agendas, well-trained staff guide the students in moving cargo and preparing the vessel to set sail. Students work collaboratively in swabbing decks and raising sails, all while singing Sea Chanteys. At the end of the voyage, the “Greenhands” must decide if they will stay on board as sailors or try their luck in the gold fields. 5th graders visit the Reuben H. Fleet Science Center and they take a 5-day trip to Boston. As part of their science studies, 5th graders go to the Reuben H. Fleet Science Center in San Diego’s Balboa Park. They have the opportunity to explore the Center’s many hands-on exhibits and they view an IMAX movie pertinent to their studies. A highlight of the year for 5th graders is the 5 days-4 nights trip to Boston, Massachusetts to experience where much of early American history took place. Students explore the city’s historical monuments and the surrounding areas, including The Freedom Trail, State House, Plimoth Plantation, Mayflower II, Salem Witch Museum, Bunker Hill, Fanueil Hall, Harvard, and The Science Museum. 7th graders take a field trip to the 11th Century! At Medieval Times, an 11th century-style castle, the King and his Noble Court give students a history lesson. There’s spectacular horsemanship, amazing swordplay, medieval games of skill, and an authentic jousting tournament. As the tournament unfolds, the serfs provide students a feast fit for a King. At the Reuben H. Fleet Science Center, the Nierman Challenger Learning Center simulations “send Jr. High students to space” using a realistic mock-up of a Mission Control center and a futuristic Space Station. The Fleet Science Center Flight Directors assist students to work as a team to carry out the operations necessary for a successful mission including the collection valuable scientific data. 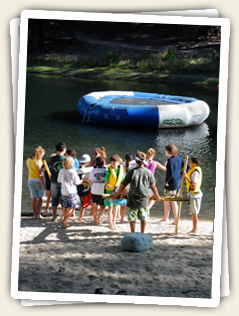 Each September, all Jr. High School students participate in a 3-day, 2-night adventure at Pali Mountain Institute, located in Running Springs, CA, near Lake Arrowhead. Student friendships are forged in Pali Mountain Institute’s group exercises. 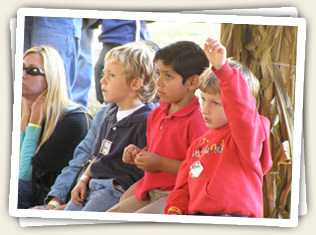 Students participate in a variety of outdoor and science education activities that involve teamwork and result in bonding experiences. Accompanied by Jr. High School teacherss and directed by the Pali Mountain Institute staff, students engage in cooperative, team-building activities that involve goal setting and group problem solving. Every two or three years, Jr. High students take very special trips. They visit the Simon Wiesenthal Museum of Tolerance in Los Angeles to participate in the renowned Tolerancenter/Holocaust Exhibit Tour that exposes the dynamics of prejudice and discrimination historically and today. Students have the opportunity to travel to Washington D.C. for a 5-day, 4-night tour of sites including the U.S. Capitol, Ford’s Theater, Vietnam Memorial, FDR Memorial, Arlington National Cemetery, the National Archives, and the Lincoln Memorial. One of the highlights of each Jr. High year is the end of year trip to Knotts Berry Farm in Buena Park.